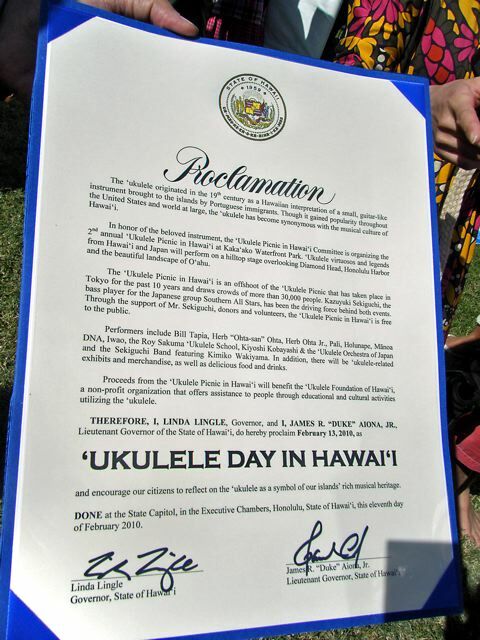 Thousands of people came to the 2nd Ukulele Picnic in Hawaii enjoyed exceptionally clear sky and beautiful music by local and international artists. Mufi Hannemann, the Mayor, and Duke Aiona, Leutenent Governer, also enjoyed this great event. In their speech, a surprise gift of proclamations were presented to Mr. and Mrs. Kazuyuki Sekiguchi, executive producers of the event. 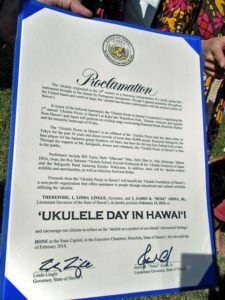 The city proclaimed 2/13/2010 as “Ukulele Picnic Day” and the state proclaimed this day as “Ukulele Day in Hawaii.” Ukulele Foundation of Hawaii congratulate all those involved in making of Ukulele Picnic in Hawaii for this achievement.